I have loved and continue to love my professional magazines. They’re like little boxes of chocolates that show up each month, and I don’t know what I’ll find until I open them. The most recent gem comes from a team of writers, including LinkedIn’s CEO Reid Hoffman. Titled, “Tours of Duty: The New Employee-Employer Compact,” Hoffman and team speak the changed (not changing – changed) world of employment. I love the contrast that comes through – are you hiring into a contract for employment, or looking for a compact to improve employability? I hope you’re getting what you want. Have you run your resume through a word cloud generator to see what you are saying most often to prospective employers? What about your personal or corporate blog? I (naively) didn’t expect to see WORK, CLIENT, KNOW, or SOMETHING (really? do we use “something” so often? no idea). And this got me to thinking about the communication dilemma: we might say and mean something, and in a specific context, and with the right mood lighting, and with a listener’s head cocked at just the right angle, they are understanding us. We’re transmitting 5-by-5. They’re picking up what we’re putting down…. you get the picture, I hope. The thing is, folks don’t always hear what we think we’re saying. They hear what they think we should be saying. This means that if we’re intent on getting our point across, we need to be clear with our message, and retell our story in several different ways at different times to increase the likelihood that our message is being received. For the MTAL word cloud, it seems that so many of the ideas, the core concepts we thought we were ranting about (and tagging with) didn’t show up. Because they were flagged as categories in a tool, and not printed in big bold letters. You are not an employee. You are Talent. Only you can define and shape your personal brand. Don’t let anyone else tell you differently. Accountability = Trust = Speed of Execution & Delegation = Success. Autonomy = Ownership = Accomplishment = Satisfaction. If you aren’t getting better every day, becoming increasingly agile, increasingly proficient working in a high concept, high touch world, you’re just getting older. Get engaged in your work, and bring your whole self to the show. Everyday. Mediocrity will suffocate quiet diligence and the gentle flicker of hope every day of the week. We’ll see what we can do to make sure we are talking straight. When we stray, tell us. And if we’re being obtuse, skip our rants and head to the postulates. It’s been awhile. Hello again. How’s the family? Yeah, the sun is starting to sneak out here in the northwest too. Yeah, I’ve been listening to a little Def Leopard, too. Ok, enough small talk. Onto the story. Rick and I wrestle with this recurring issue of performance and feedback (the impetus to kumquat, after all). Not all the work we do could be considered a “performance,” and not all praise and criticism should be interpreted as performance-related “feedback.” We still spin on this, though. 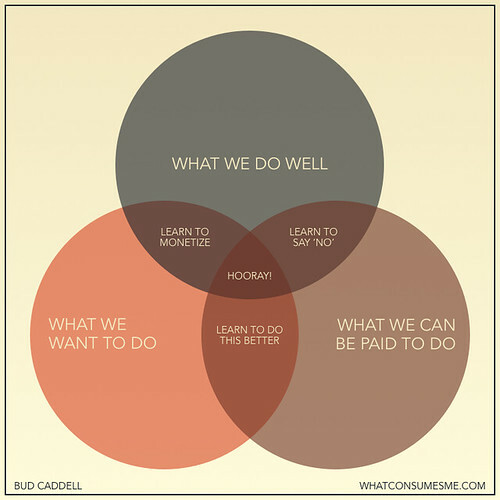 Does the client (or my manager, or my co-worker) know what makes them happy in their work? Are they excitable when it comes to their work? Did I even consider asking what the difference between “contractual delivery” and “delighted client reference” would look like? Does this project have anything to do with my clients’ happiness quotient? Have I tried to link my work to making my client happier (or their life easier, or their career more successful)? I don’t know that they are “happy” with our work. I know that they are satisfied (which is very milk-toast). I know that they are appreciative (and I am too when the barrista makes me coffee, or someone does a task I just want completed but may not want to perform). But I haven’t asked them what would make them ecstatic about the ‘refinements in project management practices’ work I’m doing for them. Maybe I’m spinning. Maybe they are just shy, and are uncomfortable glowing over the work product in the group meetings. Maybe they are telling their families over dinner what a life-changing contribution our work is making in their organization. I doubt it. And I’m now a bit embarrassed about it. I’ve totally bungled the expectation management opportunity with this client to-date. I could have been cultivating an evangelist that would sing our praises from the rooftops. Looks like I need to be scheduling a lunch conversation, and asking some long-overdue questions on expectations. So you may be thinking, “That is a sad story, but not one I can relate to. I’m an employee, and don’t need client referrals or evangelists roaming the city streets ‘selling’ me.” But that would wrong-headed, now wouldn’t it? We all need evangelists. Advocates. Referrals. Every great professional opportunity began with a first impression, and the best came about because someone helped create excitement around getting me involved. We all need cheerleaders that can rally support, boost the energy, and get the blood pressure up in a good way. We all want to do meaningful, important, exciting work. Not just you and the folks you chat with over lunch. I’m thinking of your boss’ boss, and that guy in Accounting that drives you nuts and is never satisfied. And that sales guy that is always non-plussed by your best effort. To get more out of your work, you need to ask for help. Try setting the expectation for “delighted” or “excited” or “excellent” delivery at your next opportunity. It will certainly be harder, but will likely prove more valuable to both of you.